At this time of year I’m in back-to-school mode and absolutely exhausted by keeping up with the garden, so my focus shifts to the inside. I think I’ll get back outside when it gets cooler in September, as I want to rearrange some things and prolong life and time in my garden as long as I can, but right now I’m focused on interior adornment and projects (this is one way to ignore all of the academic duties that are piling on about now). Leafing through a bunch of magazines this past weekend, I found some objects of adoration in, of all places, WSJ, the magazine of the Wall Street Journal: plates adorned with colorful parrots, infused with old-world elegance through a hand-painted process involving sixteen layers. 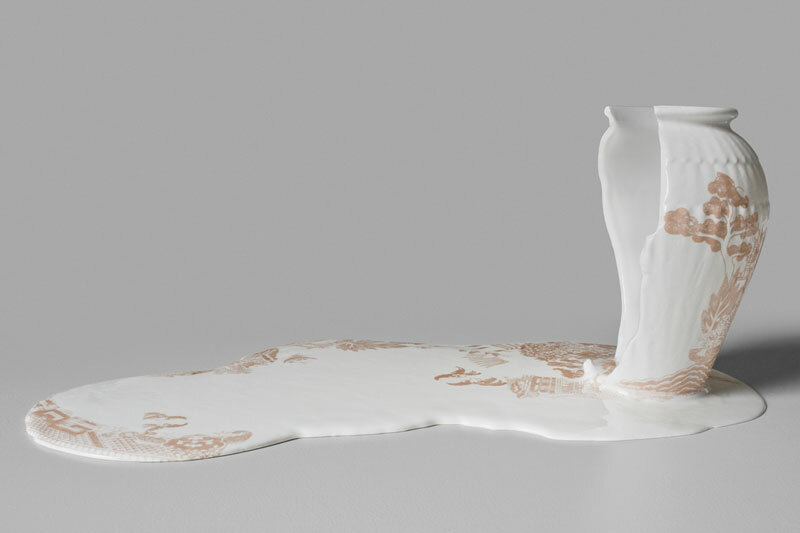 The 12-piece collection is the collaboration of Gucci Creative Director Alexandro Michele and porcelain manufacturer Richard Ginori. I want them all, but at $295 a plate, it will be difficult to justify just one, I’m afraid! The article identifies Michele’s inspiration as “one rare French volume from 1801 on specimen birds”, which was all the cue I needed to identify Jacques Barraband (1767-1809), a French zoological and botanical illustrator whose work inspired imitators even in his own day. While Barraband’s work must have struck his contemporaries as “new” in their colorful realism, Michele was inspired by their antiquated aesthetic, as am I. Original Jacques Barraband parrot prints from Levaillant’s “Histoire Naturelle des Perroquets” , Ursus Books & Prints, and Shapero Rare Books. 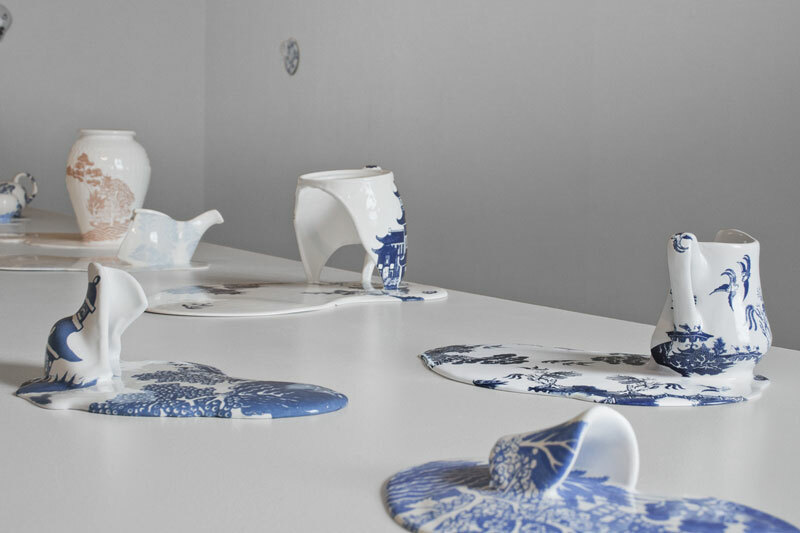 The Michele/Ginori plates from designboom (image ©designboom) and the WSJ magazine (photographs by Martyn Thompson). John Derian has ample antique-inspired parrots among his offerings too, including a 12-piece set of wall trays (works and photographs © John Derian). I just finished sweeping up the last bits of mortar and plaster dust in the house, the consequences of some oddly-timed house projects: a major rebuilding of two of our towering chimneys and some minor plastering and painting in our central hallway. So after I clean myself up, I’ll be ready for the Christmas festivities! I hope that wherever you are, things are a bit more peaceful, and less dusty–and if it is your preference (it certainly is mine), colder: we are expected to hit 7o degrees on this Christmas Eve, 2015. 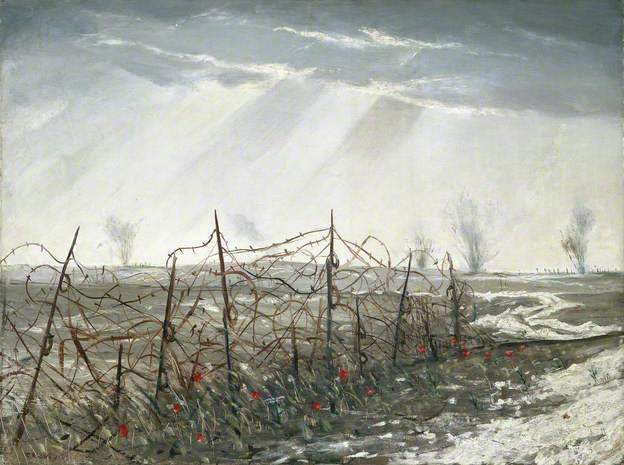 What an odd year, weather-wise, with Snowmaggedon in February and Christmas in July in December–such extremes are portents of the future, I fear. Before everything gets messed up again, I took some pictures of both inside and outside, decorations and scaffolding. We have a great tree this year, if I do say so myself, but as I find it impossible to photograph Christmas trees I’m not sure you will be able to appreciate its glory. You’ll have to trust me. My mantle decorations are the usual excessive winter wonderland installations. 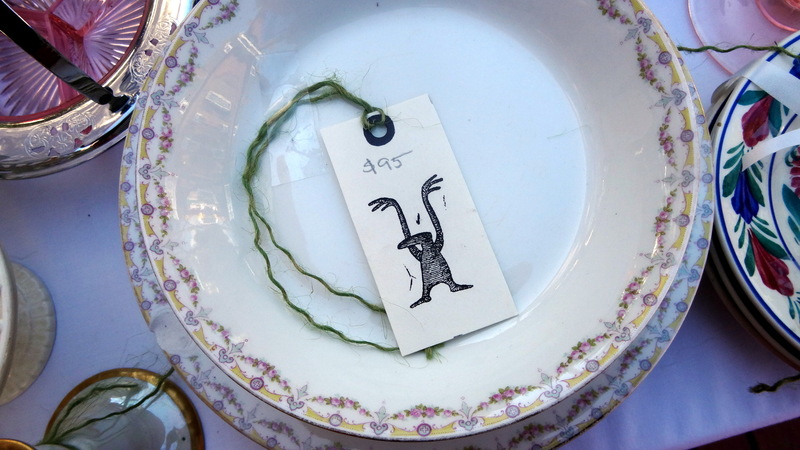 I was inspired this year by two particular creatures: an Asiatic dormouse in the form of an Asian export soup tureen dated 1760 I spotted at the Peabody Essex Museum and a Christmas card featuring a drypoint etching of a rabbit by the artist Bruce North from 1996. Nice mice are hard to find though, and the combination of mice and rabbits made my double parlor look a bit nursery-ish, so I mixed it up a bit with foxes and of course, deer. Few moments are more exciting for me than when my intellectual and material endeavors merge, and believe me, they are fleeting! One happened this past Saturday. 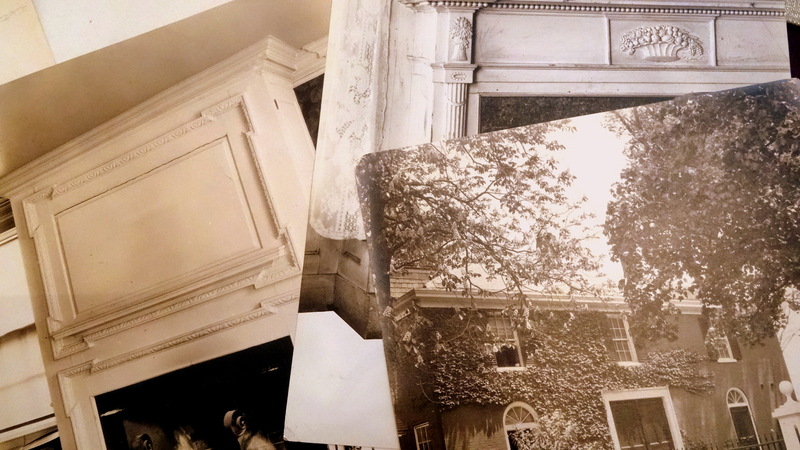 I had been struggling with two pieces that I am writing for publication on Frank Cousins, Salem’s turn-of-the last century architectural photographer, and a passionate advocate for all thing Colonial. I know a lot about Cousins, and I have a lot to say about him (because no one else has said anything), but I am not a trained 1) American Historian; 2) Architectural Historian; or 3) Art Historian, so that is why I was struggling: could I place him in his proper context? It’s one thing to refer to his “imaginary walks through Salem” and lectures on “Old Architectural Salem” and quite another to assess his contributions to American architectural history and the Preservation movement. 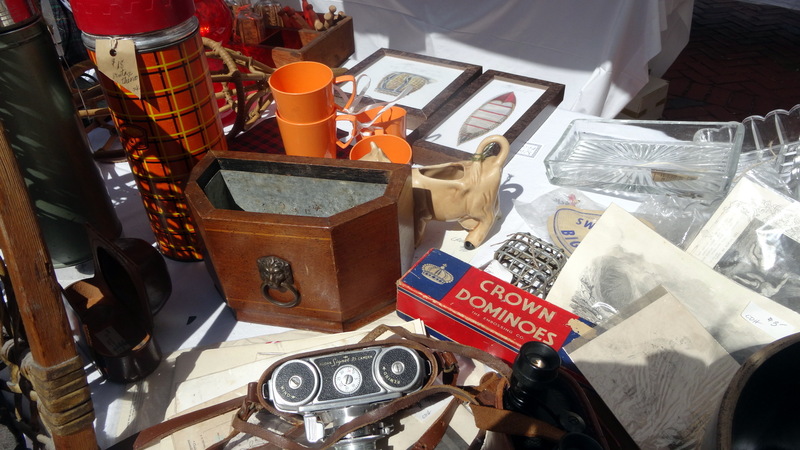 I had finished one piece and was thoroughly blocked on the other, when I decided to go over to the first ever (and hopefully not last) “Vintage Market” on Derby Square. 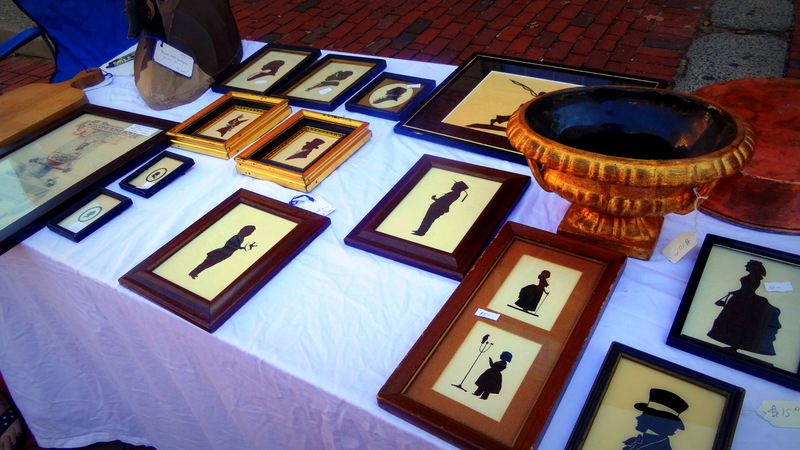 I just love the idea of an antiques market in Salem, which has such a long tradition in this trade, and even though I appreciate our farmers’ market, I would rather buy things than vegetables in Derby Square! 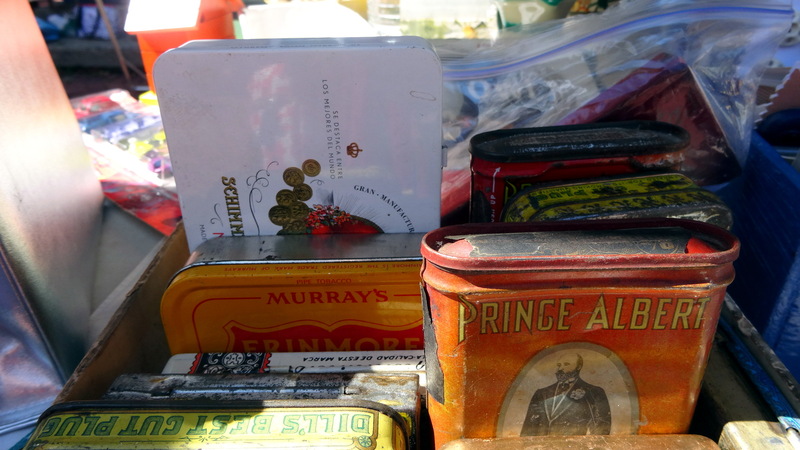 So off I went, and there was some great stuff: baskets, bottles, buttons, snowshoes, pottery, tins, bottles, and prints, lots and lots of prints, including an old box full of Frank Cousins prints. 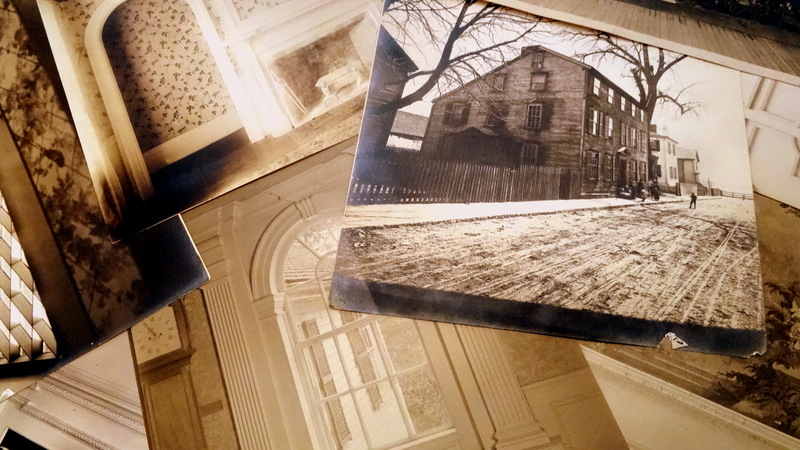 These were not the original albumen images, mind you, but large reprints made for resale at a mid-century Salem gift shop according to the man who sold them to me, who happens to run his own Salem tours. 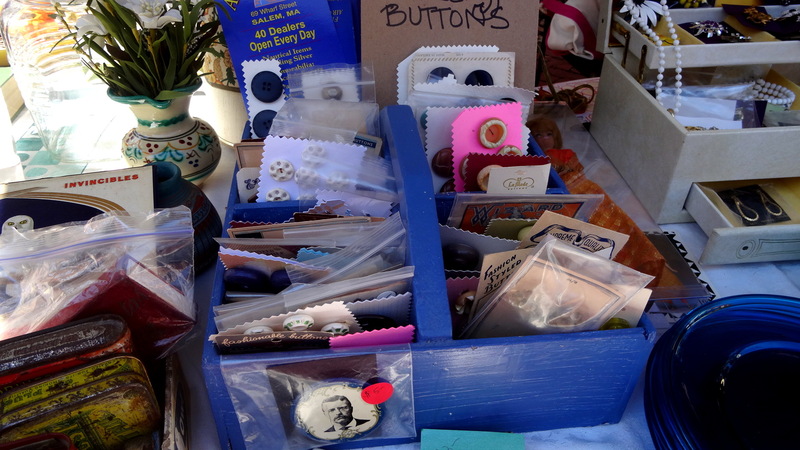 I bought quite a few, took them home, spread them out on the floor of my study, and waited for inspiration to strike. It took a while (more than a moment to tell the truth), but eventually I finished my article. I think there are two lessons here: 1) if you’re writing about someone who expresses himself visually, you must consider these expressions and 2) shopping always helps. Close-up: offerings at the First Annual (?) 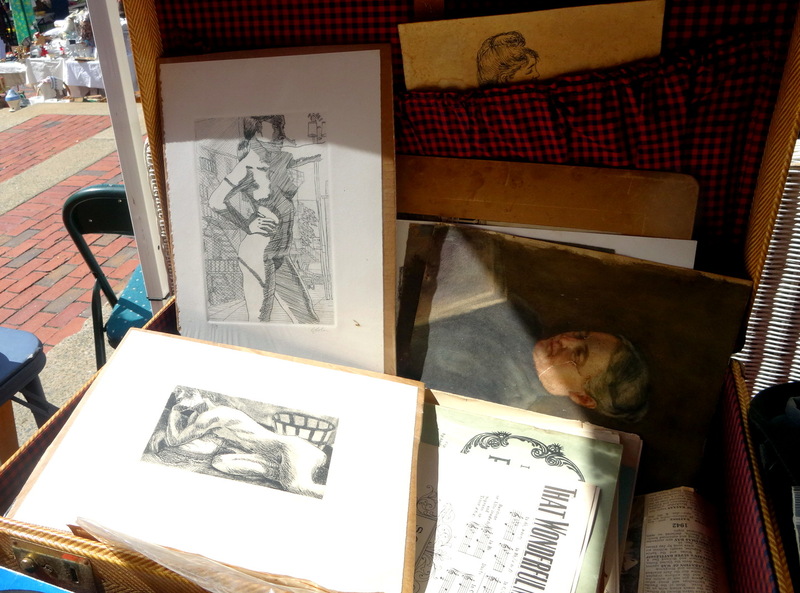 Vintage Market on Derby Square in Salem, and my catch of Cousins photographs. 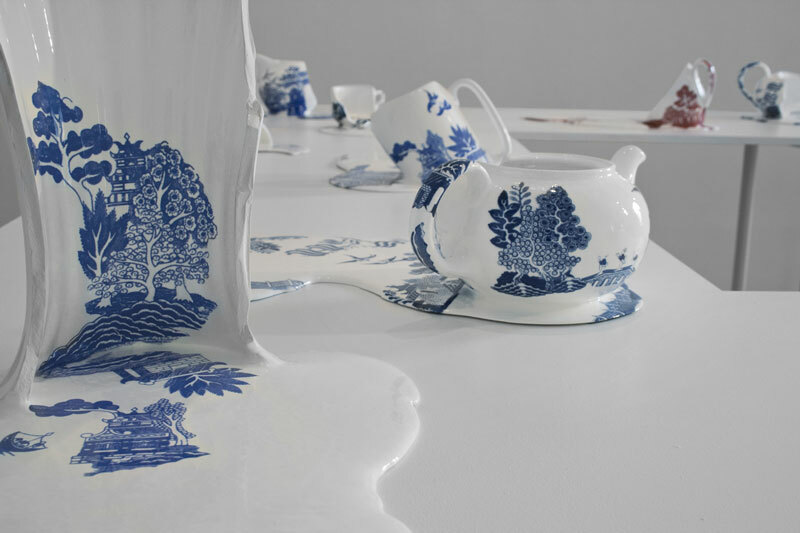 I think I’m the last person on the internet to discover the work of London-based Chilean artist Livia Marin, but I don’t care: I must feature these examples of melting ceramics (in the classic Willow pattern) because they are just so cool. 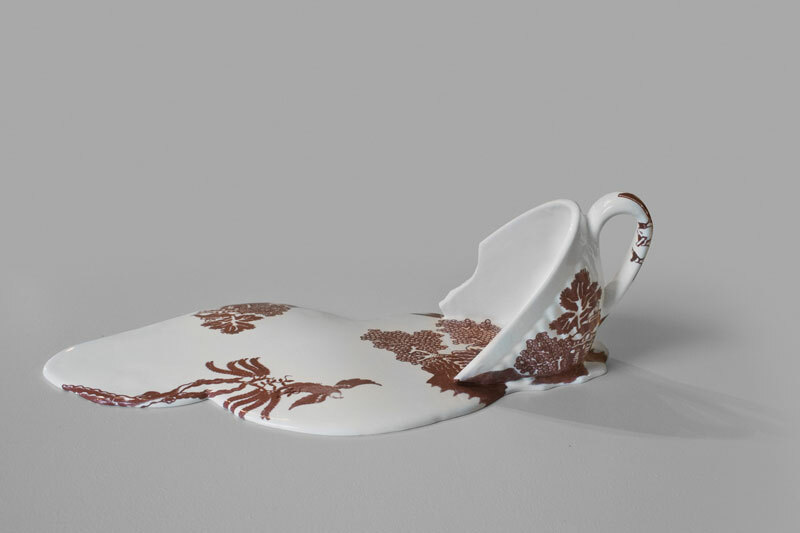 We have a healthy tea culture here in Salem, and I can just picture a tea party with whole pieces on my dining room table and a display of these pieces on the mantle. 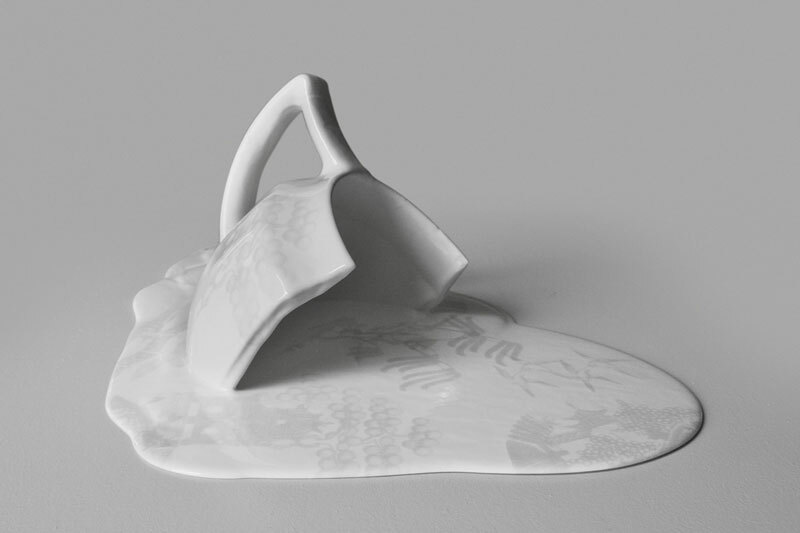 According to the statement on her website, Marin “employs everyday objects to inquire into the nature of how we relate to material objects in an era dominated by standardization and global circulation” in order to “offer a reflection on the relationship we develop with those often unseen objects that meet our daily needs”: a much more thoughtful approach to my own preoccupation with the art (and history of course) of the everyday. I suppose I could come up with a long essay on how these objects are emblematic of the China Trade and all the myriad consequences of European imperialism, but really, I just like the way they look. 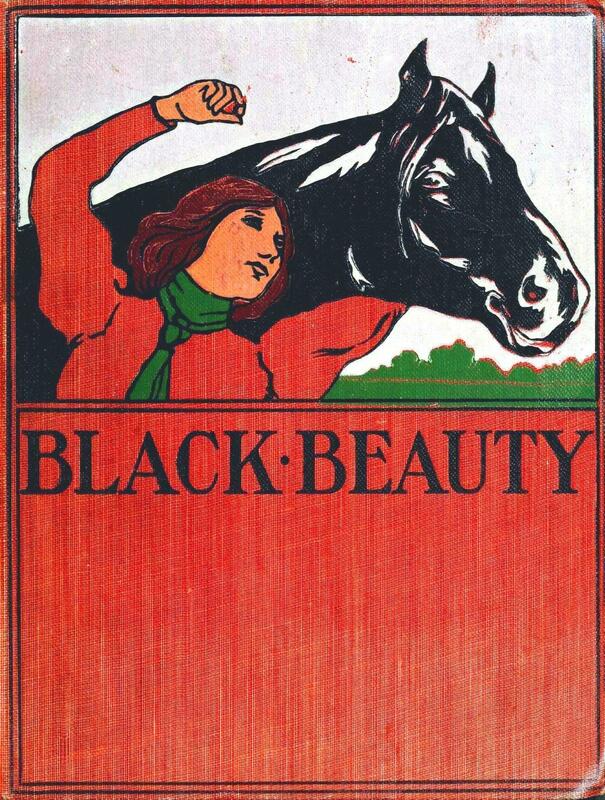 I had been wanting to write a post on Black Beauty, the first “real” book I ever read and one that shaped my childhood in several ways, for some time, and as today marks the birthday of its author, Anna Sewall, this seemed like the perfect time. So this weekend I brought out my old copy for inspiration but almost as soon as I opened it up I realized I could not read this book again, much less write about it. Don’t get me wrong: it’s still a wonderful book: I just don’t want to go through the horse’s painful journey again. 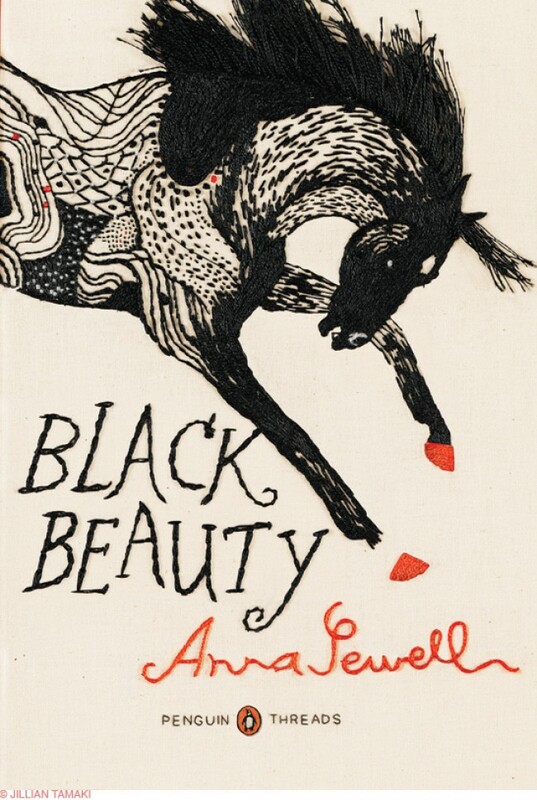 Of course everything turns out all right for Black Beauty in the end, but Sewall gives him such a strong voice, and fills his story with so many harrowing, realistic details, that the moment I opened up the book (after decades) it all came rushing back. I can’t imagine how I had the courage to read this tome in the first place at age seven or eight: the fearfulness of youth, I suppose! But I’m not going back: the protective material side of me has surfaced, fortunately, and I’m going to focus on the decorative aspects of books today instead of their content. 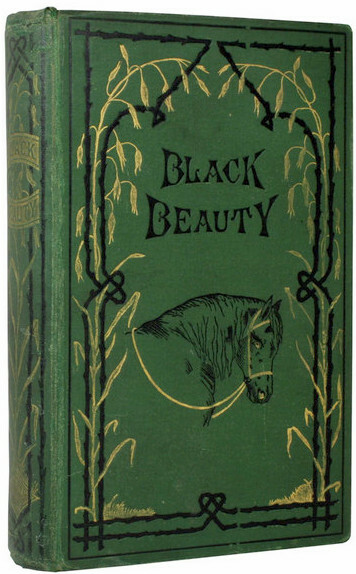 Covers of Black Beauty: 1877 first edition, 1897, and 2011 Penguin Threads edition–with design by Jillian Tamaki. Enough of suffering, compassion and sanctuary! 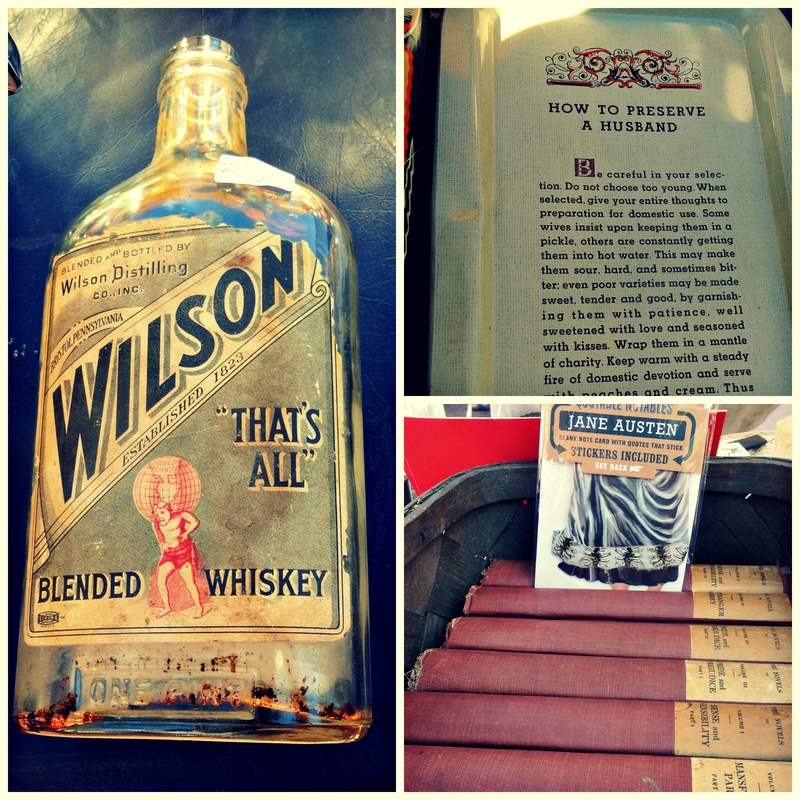 Like anything that seems likely to go away, books have becoming more precious as objects for some time, both in their original form and in variations and adaptions. 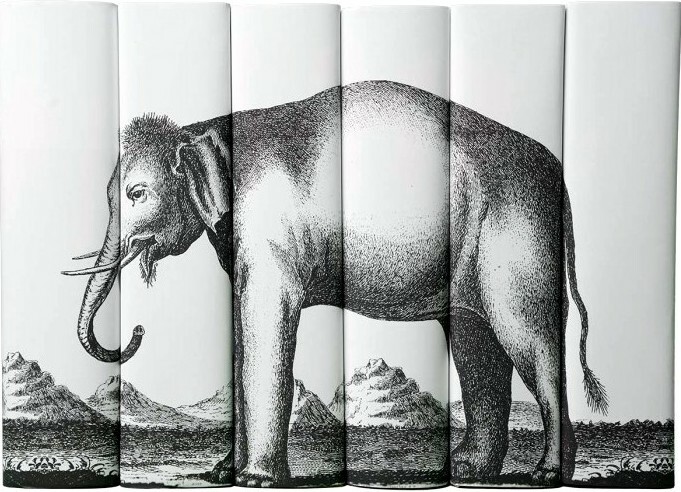 One company that seems to be bridging the gap between literature and art is Juniper Books, which offers ready-made and custom collections of books gathered around a particular author or theme with covers and spines designed to decorate the bookshelf. 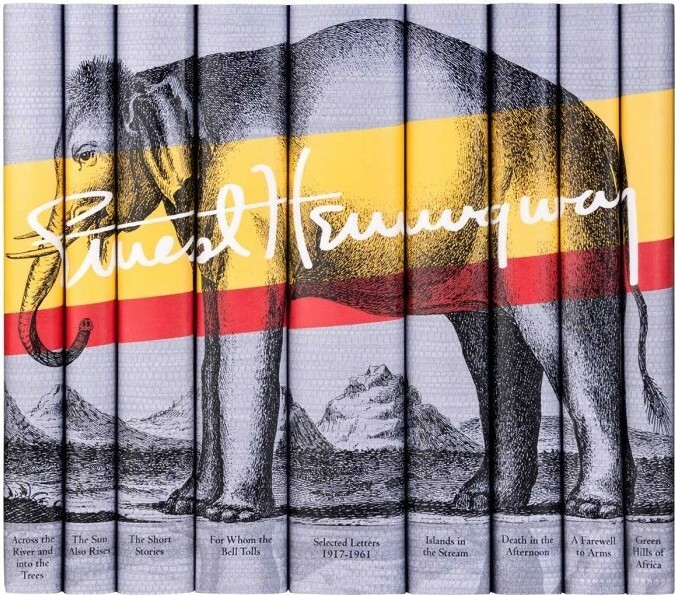 When they can’t find an appropriate set of books to house their designs–they just cover up odd volumes–and so we have an Ernest Hemingway set of elephant-embellished books and an anonymous set of elephant-embellished books, all ready for a pachyderm-themed study (like mine). 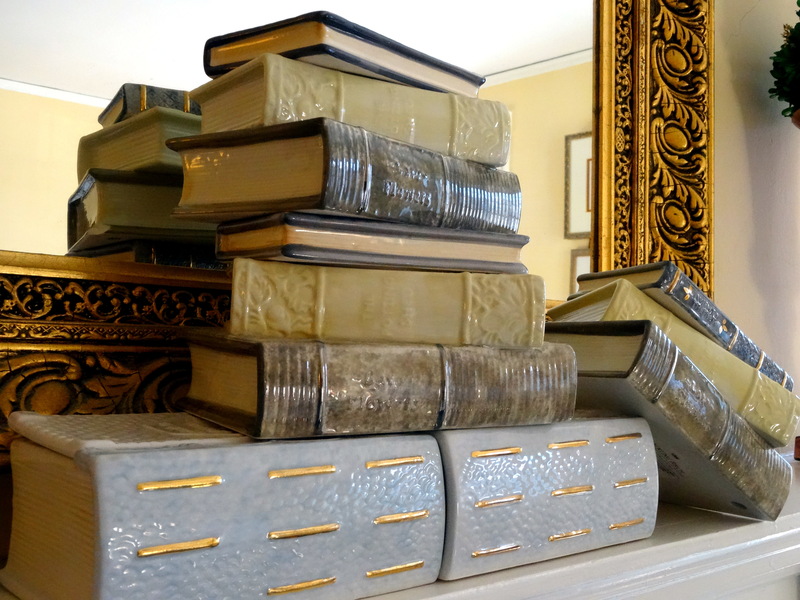 And if you’re just looking for book forms, there are a variety of options: ceramic books are my particular preference of this genre –book-shaped vases and flasks go way back, at least to the eighteenth century. A couple of years ago I bought up as many of the book candles below as I could obtain at Anthropologie (a store that will put candles in anything and everything): I didn’t particularly care for the candles (still intact); I just liked the “books”. 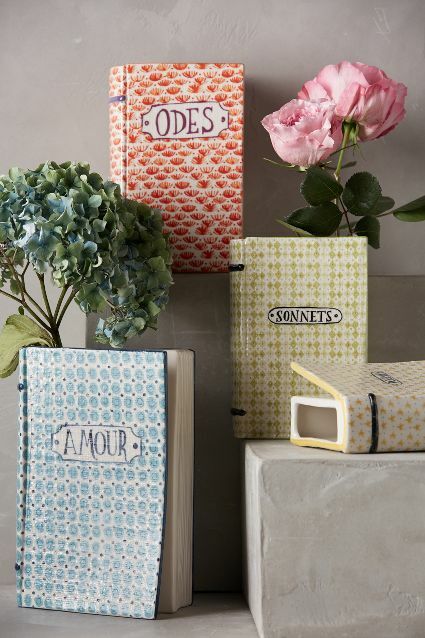 They are long gone from the store now, but these more colorful book vases are still very much in stock. A bit more sophisticated examples from Seletti and Kim Marsh are available here and here, and I suspect I could gather much more. 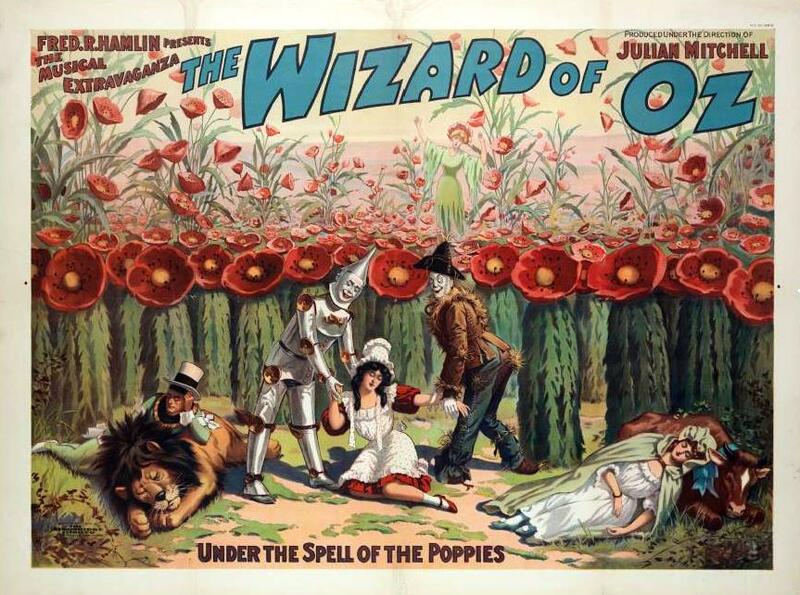 Back to World War I remembrance; I can’t help myself: I’m under the spell of the poppies–not real poppies (which I really don’t care for all that much) or the intoxicating poppies alluded to in the captivating Strobridge Wizard of Oz poster below, but the thousands of ceramic poppies that are now literally spilling out of the Tower of London in remembrance of British lives lost during the Great War. 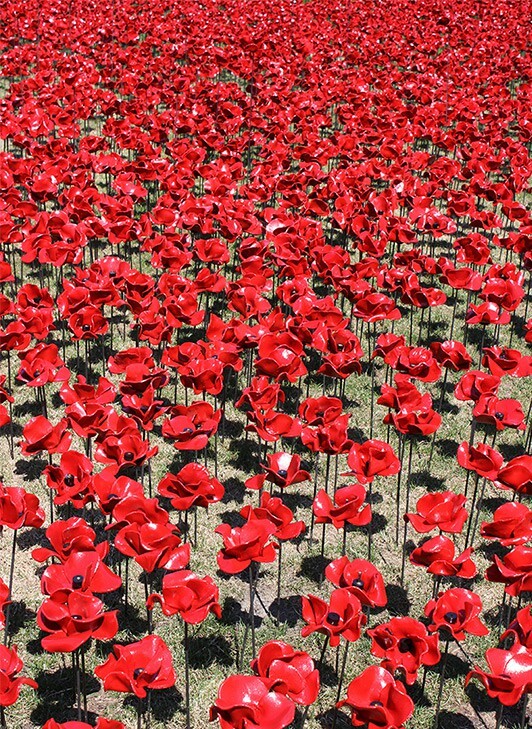 Blood Swept Lands and Seas of Red, the vision of ceramic artist Paul Cummins and stage designer Tom Piper, opened yesterday–the day on which Britain entered the war–and will expand over the fall, until there are 888,246 flowers in total, one for each soldier from Britain and its empire killed during the war. 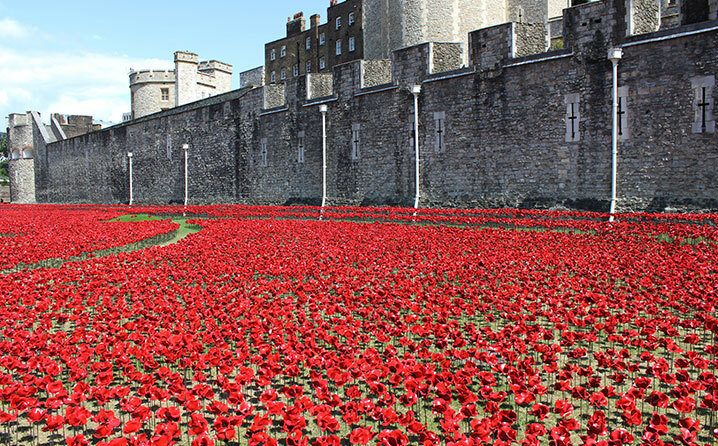 The final porcelain poppy will be “planted” on November 11, Remembrance Day, a day which has long been symbolized by the poppies of Flanders fields. 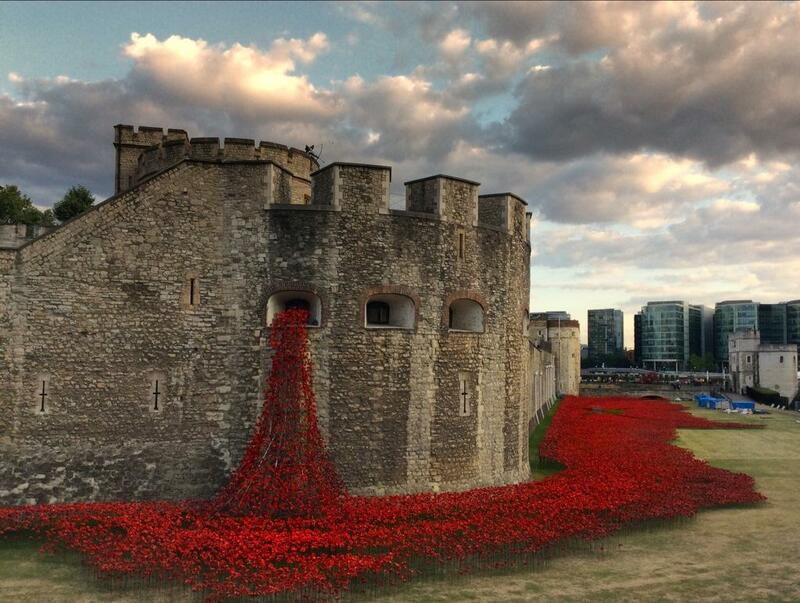 The images of this installation are so striking that I can’t wait to see the real thing; I’m planning on heading over to the UK in October, which should be just in time.